Recent months have brought shocking photos showing new manmade islands and a gargantuan industrial effort in the South China Sea being undertaken by the People’s Republic of China (PRC). The sheer scale of the work was almost the perfect metaphor for modern Chinese foreign policy writ in sand: we’re big, we’re capable, and we can and will build whatever we want. Following a decade of increasing tensions, China is making its boldest move for dominance of the South China Sea. After years in which all regional parties have used fishermen and coast guard boats to impede or arrest foreigners in the disputed region, China is cutting through the proverbial Gordian knot of maritime territorial conflict. The ramifications of the construction have not been lost on China watchers. These islands are a patently transparent effort by China to bolster its claim to contested territorial waters from an expanded presence on and around the Spratly Islands. However, the efforts are part of a larger problem with China and Western interactions. In this case, it specifically has to do with differing interpretations and adherence to international norms and laws (principally the international law of the sea and maritime border definitions). With so much at stake in the South and East China Seas (economic resources, environmental issues, and security matters), new scrutiny must be paid to Chinese strategists and political thinkers’ opinions, interpretation, and past behavior with regard to international maritime law. This piece seeks to better define the vagaries and uncertainties (to outsiders) of these interpretations. It advocates for new engagement strategies, tools, and policy initiatives needed to address this problem before it becomes a serious security liability for the U.S. and its allies. The current site of the construction lies roughly 810 miles (1300 km) off China’s coast, well outside traditional norms of contiguous maritime territorial claims. China and its neighbors have all claimed the Spratly Islands for the past six decades with all but Brunei constructing facilities in attempts to buttress their claims. No doubt the proximity of the Spratly Islands to the five closest claimants (Brunei, Vietnam, Taiwan, the Philippines, and Malaysia) means that a multilateral agreement must be made to prevent disaster and keep open some of the most important shipping waters in the world (roughly $5 trillion in ship-borne trade a year), but that would be under the best of hypothetical situations with China removing its presence there. Moreover, none of these states can hope to match the PRC in terms of economic or military power, and all parties have considerable economic and ecological interests to consider. The South China Sea is a resource haven for its littoral states, all of which have developing economies (save for Brunei which, although only having a population of roughly 400,000, is considered developed). 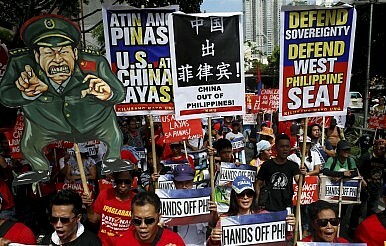 The U.S. Energy Information Agency “estimates there to be approximately 11 billion barrels (bbl) of oil reserves and 190 trillion cubic feet (Tcf) of natural gas reserves in the South China Sea.” However, resource extraction and energy development is just one facet of the Spratly Islands conflict. According to the United Nation’s Environmental Program, the fisheries in the South China Sea account for roughly one tenth of the world’s global fish stocks. With a quarter of the world’s population living in the surrounding littoral states, the region is a crucial foodstuff resource. Proper management by local authorities is a crucial aspect to keeping those fisheries healthy, protecting the environment, and preventing over fishing from being depleted entirely. These protections and policies, however, cannot be developed much less enforced while territorial dispute persist. The 1982 United Nations Convention of the Law of the Sea (UNCLOS) defined territorial waters as extending at most 12 nautical miles (22.2 km, 13.8 mi) from a state’s coastal shore, with an Exclusive Economic Zone (EEZ) extending 200 nautical miles. The language of the Convention further stipulates that baseline island structures must be exposed above water at low tide to be considered a further extension of territorial and EEZ for the state. Now it is worth noting that the UNCLOS has been an evolving document since its establishment as new international norms and necessities arise, but claimants through international arbitration structures have been the accepted norm for the majority of expansion of continental shelf and EEZ claims. It is worth noting that the Philippines was one of the foremost critics of its ASEAN partner states for breaking the united front of multilateral talks on maritime territorial claims with China, bilateral negotiations giving the larger and richer PRC considerable advantage. The last five years of exploration and development in the South China Sea have bred new security tensions between China and its neighbors. The tensions have prompted the Obama administration’s Asia rebalance, a sore spot for China, which has declared that the conflicts are themselves part of American interference and meddling. The argument is a familiar one to China watchers, it asserts that America and its allies are seeking to “box” China in and forestall its peaceful ascent. Why China feels threatened by American engagement in the region is as important to dealing with the South China Sea as the methods with which China pursues its goals there. Much has been written by other China watchers on the lasting impact of the “Century of Humiliation” that has shaped the Chinese Communist Party’s (CCP) rule, so I won’t go into greater detail on that other than to stress that China is especially sensitive to perceptions of foreign interference with what it deems as sovereign affairs. Instead I wish to explore a different aspect of China’s interactions with its neighbors based on the concept of suzerainty, or a form of tributary fealty to a greater lord by a lesser. Henry Kissinger wrote in 2011’s On China that much of the philosophical outlook of the Communist Party was still rooted in the cultural traditions of Imperial China, despite the dramatic efforts by Sun Yat Sen and Mao Zedong to purge Confucianism and holdovers from dynastic eras from modern China. The historical mindset of the Middle Kingdom was that it was the center of all civilization and that its smaller neighbors must exist in suzerainty to it, giving tribute and paying homage to the Emperor even if the Imperial ages saw little conquest of the region. For thousands of years China was the largest and richest state in the region, and this encouraged a certainty of its own perfection that led to folly late in the 18th century. Kissinger’s take was that the rising and modernizing China was pursuing a prominence in global stature that was viewed as a historical necessity for survival, if not a mandate for one of the oldest civilizations in the world. This interpretation does not wholly describe the CCP under Xi Jinping, but it is worth noting as China regains a position of economic and military influence. China’s take on the UNCLOS has been complicated and difficult to divine. On the one hand, it makes broad use of the established norms when it suits its claims; on the other, it patently ignores them when matters of distance and historical claims come into play. The continued loggerheads at which China finds itself with Japan over the Diaoyu/Senkaku Islands is proof of the dangers of this approach. China has routinely stoked anti-Japanese nationalism at home, helping Japanese Prime Minister Shinzo Abe push forward historic changes to Japanese defense policy. The lengths to which Beijing is willing to go to shore up its control of the South China Sea have their own implications for the physical security of the region’s littoral states. Most prominently though are the ecological impacts of the competition for this region. The South China Sea is home to fisheries that locals have relied upon for subsistence over many generations. These fisheries do not exist in an ecological vacuum and the island building and dredging process has already had dire consequences for the coral reefs required to maintain a healthy sea ecology vital to healthy populations. Beijing’s recent construction of a string of artificial islands in the waterway “is causing widespread destruction of the region’s biodiversity” that will “irreparably damage the entire ecological balance in the West Philippine Sea and the South China Sea,” Irene Susan Natividad, the Philippines‘ deputy representative to the United Nations, told a U.N. Security Council session this month. “Such irreversible damage will have long-term effects on all the peoples across geopolitical boundaries who have depended on the sea for their livelihood for generations,” she said. However, the attraction of resource extraction for crucial energy sectors makes the difficulty of resolving these claims even greater. China is hardly alone in Asia in seeking to exploit the natural gas and oil reserves being projected for the region. For example, Malaysia’s energy sector contributes a fifth of its national GDP with an estimated reserve life of 25 years in its existing fields. So it can hardly be expected that, even without provocative Chinese actions within the South China Sea, there would not be negative effects on the environment in the region; someone else would most certainly be drilling. But that is where the core of the conflict comes from: International arbitration to stabilize the maritime borders and claims has been consistently absent, and that absence makes fisheries and ecological management impossible even though it is crucial for such industries. Aquino also indicated the high-stakes engagement that the Philippines was in. New light has been shed on China’s rapid reclamation efforts to build an air strip on Mischief Reef. And Aquino said he was taking seriously reports of a possible surprise occupation by China of Manila-occupied Pagasa Island, though these have been officially denied by Beijing. Contingency plans were in place, he stressed. Aquino has been the most vocal Southeast Asian leader on the maritime borders conflict, but he and his cabinet are correct: Their options are becoming more and more limited by Beijing’s heavy-handed tactics in the region. If international arbitration in formal structures is being ignored, the next step will be a cold war in the South and East China Seas between Beijing and the states into whose waters they are pushing. Worse, there is no guarantee that a security framework between the smaller states may hold. Instead of a bipolar standoff with ASEAN, Japan and Taiwan opposing Chinese claims, we could very well end up with a fractured set of alliances all opposed to one another. America’s security ties and its role in peacekeeping in the North Pacific will put it squarely in the middle of a complex security crisis that will, at its best, be a liability for the diplomatic corps and, at worst, a genuine conflict. For Beijing, too, the risks are high. Although China is considerably larger and fields a more powerful military than any of the other claimants, it is vulnerable to a loss of access to the sea lines of communications (SLOCs) through the Strait of Malacca and the North Pacific, which would be devastating to its economy. So how should the U.S. approach this issue? China is historically prickly about the 7th Fleet and views America’s network of alliances in the region as attempts to block China from assuming its rightful place as Asia’s hegemon. Military engagement on a naval level is precisely what the People’s Liberation Army (PLA) has been planning for these last sixty years. The PLA’s development of the anti-ship ballistic missile system displays a focus on technologies and platforms designed for area denial for carrier groups. Beijing’s military policies make it clear that Western hard power influence should be a last resort. From a diplomatic perspective, it is also clear that direct military action is what Beijing expects of the U.S.; thus, it is in America’s interests to engage China first as responsible stakeholders and political equals. This suggests that considerable diplomatic theater will be needed to forestall conflict. A display of respect by the American leadership plays well for the Chinese leadership back home, making them more amenable to engagement. In a difficult scenario, results are likely to be better if attention is paid to these cross-cultural and historical nuances. The key takeaway strategy considers America’s approach to engagement on the issue. How the U.S. frames its intentions is just as important as how it develops the tools to resolve the issues. Beijing expects the worst, so if Washington wants China to recognize the validity of its neighbors’ claims and disputes, it must avoid looking imperious itself. Given the above, multilateral engagement appears the best option for U.S. statesmen and military thinkers hoping to prevent a cold war from turning hot. The U.S. must bring its security allies and their claims to the table with China and seek a position of assistance and arbitration in order to fairly divide the territorial waters on terms agreeable to all the states.. Naturally, the language of such a deal will be complex and will very likely establish a new precedent for international trade and exclusives economic zones. However, as disconcerting as the prospect for new political and trade norms may be for stakeholders, the evolution of international law is hardly new with regard to littoral waters, and preventing a conflict in the South China Sea is of utmost primacy. One such norm that must be established is the nature of development and construction by states, as well as a limit on what littoral states and claimants can do, to ensure responsible development of the region that does not harm fisheries. Moreover, if territoriality and development norms are agreed, the states must develop a multilateral commission with the enforcement tools to manage the ecology of the energy extraction and fishing industries within the South China Sea. The Magnuson-Stevens Act of 2006 put in place regulatory guidelines and enforcement to both protect the ecology and maintain fisheries in U.S. federal waters. Since its implementation in 2007, it has reduced the number of overfished stocks by 75 percent and saved key commercial and recreational fishing industries from disaster. The framework and science for this initiative already exist; they only need to be made manifest by the nations themselves. Too often in the West, food security is taken for granted, and the implications of resource scarcity are not fully appreciated, except through late-night commercials and half-minute reports. However, this scenario could very realistically bring about conflict over oil and mineral rights, as well as catastrophic deprivation of foodstuffs for a quarter of the world’s population. It is in the interests of the U.S. to seek diplomatic channels now to rein in the South China Sea disputants and establish a body that can help put these issues permanently to rest. Scott Devary is a China analyst with a background in nuclear nonproliferation and security topics. Scott Devary holds a Master’s of Arts in International Relations and Diplomacy from Seton Hall University and a Bachelor’s of Arts in Political Science from the University of Washington. He studied Mandarin Chinese at Tsinghua University in Beijing, PRC and has been a contracted researcher at the U.S. Department of Energy’s Center for Global Security and Brookhaven National Laboratory. After the Summit: Where Do US-China Relations Go From Here? What's Beijing’s regional strategy in 2017, how should Washington respond, and where did the Xi-Trump summit fit in?